Construction work on Ravenna Point began last summer, and is part of Chichester District Council's pledge to support local businesses. "I am delighted that this key project to support our local economy is ready," says Councillor Tony Dignum, Leader of Chichester District Council. 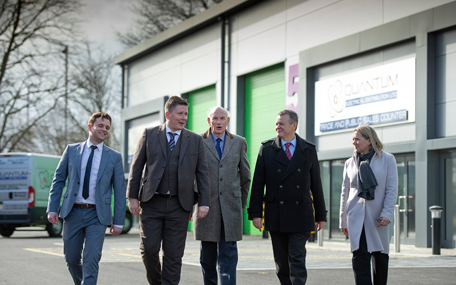 "We are very pleased to welcome the first tenant, Quantum Electrical Distribution Ltd. The company is looking to expand and has chosen Chichester as its second location. The site will provide modern and high quality space for trade type businesses and will also provide employment for local people. "Ravenna Point follows the opening of the Enterprise Centre last year, also situated in Terminus Road. The centre is aimed at helping start-up, small and medium sized businesses and there is already excellent take-up of the units." Managing Director of Quantum Electrical Distribution, Tony Jenner, says: "With the rapid expansion of the Quantum brand, Quantum are very pleased and proud to continue our growth and success in the ever developing city of Chichester. The location of Chichester was chosen by Quantum for our second branch due to its buoyant local business activity, historical presence and great connections to the A27 and neighbouring towns and cities namely Bognor Regis and Portsmouth." Each unit at Ravenna Point will provide between 230 and 300 square metres of floor space, plus the potential to add a mezzanine floor, at a tenant's discretion. There will also be the option for each business to dedicate some space to a trade counter area. It is predicted that each unit will employ around five people. The site was previously home to Goodwood Metalcraft, but the building was no longer suitable for modern business needs and it was demolished to make space for the new units. "Because the site is owned by the district council, the rental income will go towards helping us provide key services for our residents," adds Cllr Dignum. "This site will add to our portfolio of business accommodation, allowing us to offer a variety of options for local businesses. As well as the Enterprise Centre, we also offer other options at the Woodruff Centre in Terminus Road and the St James' Trading Estate."